I went with a mostly silver and white color scheme this year for Christmas...A tinsel tree, mercury glass, and lots of frosted greenery and even some glass icicles. I didn't decorate as much as I have in years past, and may do some more, but here is my take on Christmas this year! I still have to photograph the rest of the decor in the Dining room....it is very French and Chic! Mercury glass ornaments are gathered in a crystal chandelier re-purposed as a bowl. By placing it on a mirrored table the effect is stunning. Lots of tone on tone silver and white compliments the all-year decor of the room. 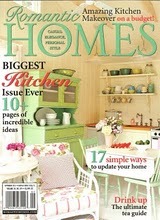 Like my December 2012 article in Romantic Homes Magazine says, red and green don't always work for Christmas Decor! I love my tinsel tree! I placed some vintage ice skates, a French plate with a winter scene, some numbered cards, and a Nativity figurine. This Nativity is one of my favorites. Glass icicles add to the sparkle and give and extra touch of wow factor to the tree, and mantle. I used mercury glass and white ornaments. I love the pine cones! My butler's ball is at the center of the mantle, with silver deer, and plenty of artificial greenery. I got the poinsettias and silver holly from Michaels. The faux evergreen came from an Estate sale arrangement that I ripped apart. Silver and rhinestone frames display winter images of birds, and add just a hint of color. I love these bottle brush trees....they are from Target, the mercury glass pot it sits in came from Big Lots. The glass icicles look real. I can't believe I pulled this whole thing off in about three hours, did I say I still had to take all my Halloween decorations down? The pop of gold from the mirrors adds to the sparkle. By decorating for Christmas using the colors already in the room, it appears your whole room is decorated, even though only small vignettes here and there are actually done. Here is another bit of decor, this time in the Dining room...more photos from there to come! Merry Christmas!